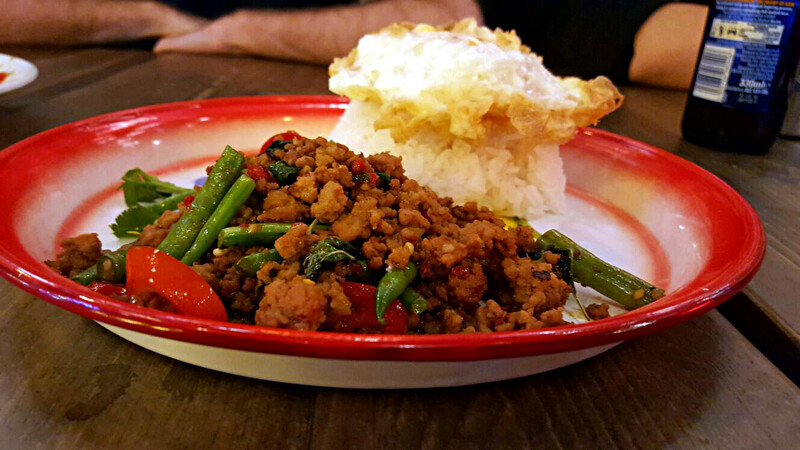 Zaap’s doors opened this week promising “a slice of Bangkok in the UK”. The restaurant, residing next to Oaks on Maid Marian way, is busy in its decor. Bright colours and a urban style make it quite a unique space that attempts to deliver the street food style they are driving for. They say they embrace the concept of eating together, and the menu does give you plenty to choose from. The majority of dishes are curries, noodles and soupy things. While I was waiting for some friends to arrive I went for a few ribs in black bean sauce. Whilst the menu stated 3 pieces there were several smaller ribs. The meat come away from the bone well enough but the smaller ribs were very fatty and fiddly to eat. The sauce was run of the mill, could have been “chinese ribs” from a takeaway. At £5.50 it didn’t break the bank but equally I wasn’t impressed. Hoy Tod was something a little different. A crispy mussel pancake was enjoyable with some provided hot sauce, but it did need that to lift it. Probably my favourite dish was Pad Ga Prao, minced pork fragrant and well spiced. The addition of a fried egg is always welcome, whatever the dish is! Main courses were typically £7.50-9, the majority of which included rice. Three of us decided to share three quite diverse dishes, though we ended up with a 4th that we added later. 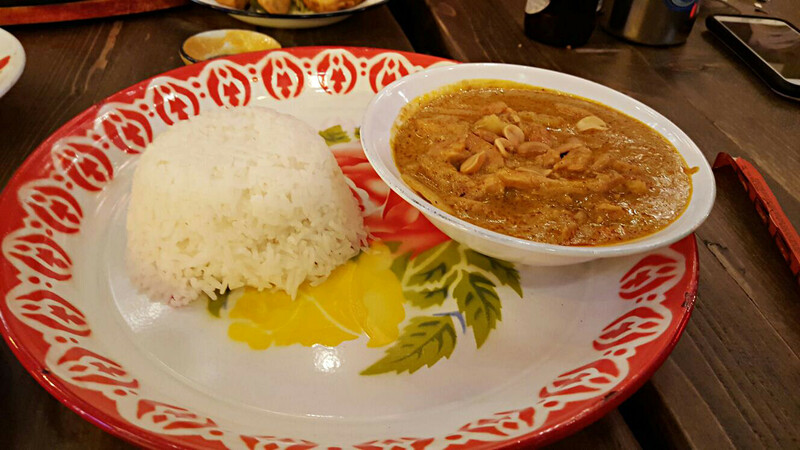 We decided that a Massaman would give a good benchmark against other Thai places. It compared fairly favourably. Rich and creamy with well cooked potato and chicken (for some reason no beef option) but a little heavy on the cinnamon. Beef noodles in a soy sauce didn’t measure up quite so well. The dish lacked any sort of punch, flavour bland, noodles flabby and the beef a little grey and unappealing. A little mixed in quality and consistency overall. Despite the encouragement from the restaurant the dishes are a little hard to share, the food not naturally lending itself to do that. The portion size too was a little strange, the average main dish at £7.50 not really filling you up if you’re anything like me. Despite this it seemed pretty reasonable value, 3 dishes between 2 and a beer and you’ll end up spending £15. If things were a few pounds cheaper we’d have all agreed it was great. I’d still probably prefer one dish at posh equivalent Tarn Thai but with its relatively unique positioning in Nottingham’s food scene I expect Zaap to be popular.